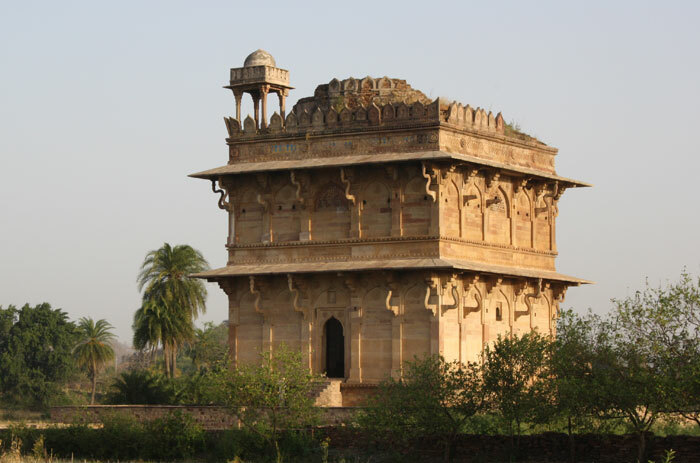 This simple yet imposing building, located on the Isagarh road at a distance of 4 kilometres from Chanderi proper, was built in 1445 as a victory monument. 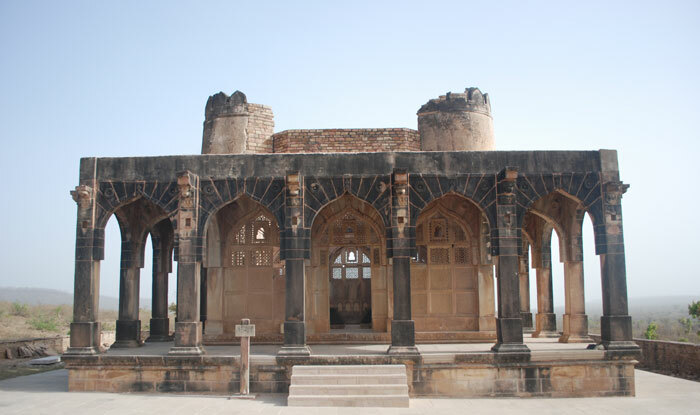 Chronicler Mohammad Kasim ‘Farishta’ in his Tarikh-e-Farishta mentions that the palace was built by the Sultan of Malwa, Mehmood Shah Khilji, to commemorate his victory over Sultan Mehmood Sharki in the battle at Kalpi. 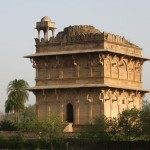 This elegant structure, built on a 12 feet high platform, stands near the Parmeshwar Pond. 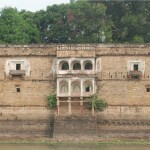 On the outside the wall has been divided into the tall first storey and the slightly shorter second storey which are relieved by a series of arched depressions. 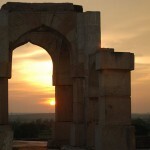 The most striking element of the monument are the unusual, serpentine brackets which support the eaves at both the levels. The inside of the monument, however, is a single square room with only one true storey. 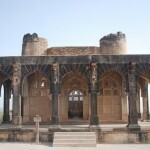 Built in 1450 under the aegis of Mahmood Khilji I of the Malwa Sultanate, this elegant structure is actually the tomb of a mudarris (teacher) and the aalim (vice –chancellor) of the darool uloom (university) which was functional during this period, and the ruins of which can be seen in the vicinity. 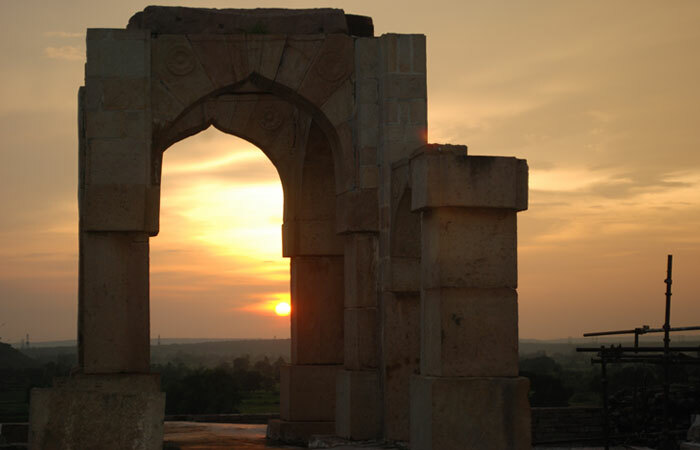 The term madarsa is a misnomer; it probably got associated with this monument due to the presence of a madarasa in the surrounding area. 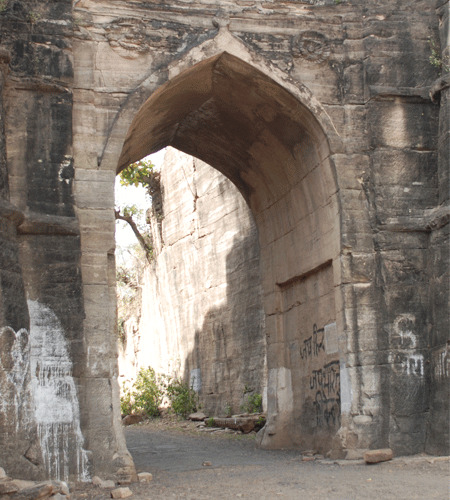 This heraldic structure, cut entirely out of living rock, is situated on the southern edge of Chanderi, forming a link between Bundelkhand on the north and Malwa on the south. Standing tall at 230 ft above ground level, the gate itself is 80 ft high and 39 ft wide. 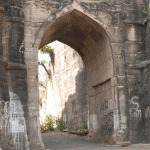 An inscription both in Devnagari and Nask scripts, on the eastern wall of the gate states that its construction was commissioned in AD 1495 by Jiman Khan, the son of the then Governor of Chanderi, Sher Khan.